This is an In Person signed Colour 5.75" x 3.5" Publicity photocard by the American Rock band. 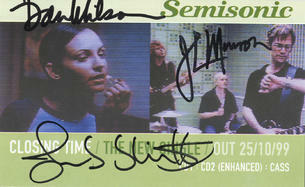 Semisonic is an American alternative rock band formed in Minneapolis, Minnesota in 1995. The band has three members: Dan Wilson (lead vocals, guitar), John Munson (bass guitar, backing vocals, keyboard), and Jacob Slichter (drums, percussion, keyboard). They are best known for their late 1990s hit singles "Closing Time", "Singing in My Sleep" and "Secret Smile".